Villa Estrelicia can be rented with 5 or 4 bedrooms, villa with sea views. Beautiful large, very private pool, wide walk-in steps & optional pool heating. Estrelicia's sunny, south facing pool and partly covered terrace with sea views. Enjoy, Estrelicia's lovely lawn areas, terraces and BBQ overlooking the pool. Estrelicia. Very private, relaxing sunbathing areas with terrace sound system. Sunny, south facing, very private, sunbathing areas, terrace, and sea views. The spacious Lounge/diner with sea views, overlooks the gardens, lawn and pool. Spacious, open plan lounge/diner with large table, comfortable sofas & cable tv. 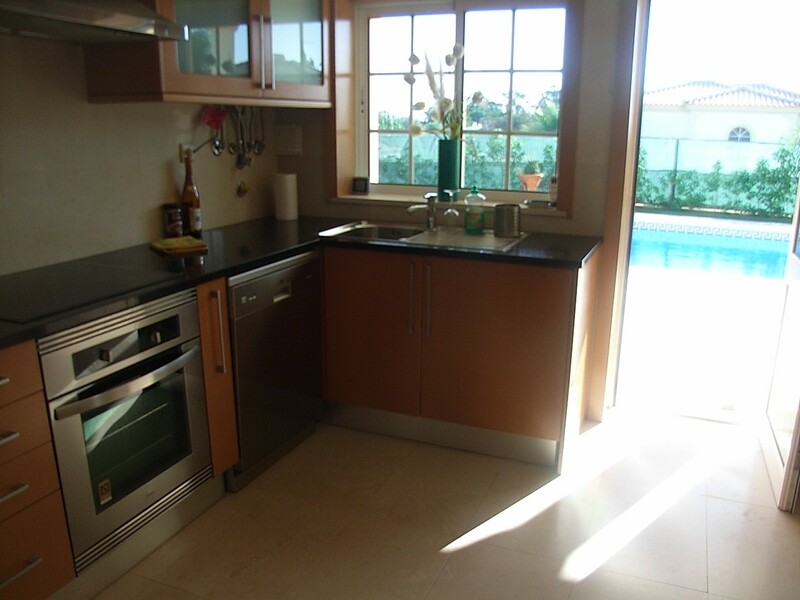 Fully equipped kitchen with sea views, overlooking pool & established garden. Ground floor deep red room with double doors to covered terrace garden and lawn. Typical bathroom, all complete with combined bath/shower. 1st floor Turquoise bedroom with TV, and double doors to terrace & sea views. First floor turquoise & green bedroom terrace with superb sea sea views. One of 3 lower ground bedrooms all with a/c, built-in wardrobes with mirrors. Sta. Eulalia! Our local, picture postcard beach with restaurant, cafe/bar 1.8kl. Algarve & Balaia's green coastline, also with the best beaches in Europe. Olhos Agua! Local, beautiful fisherman's beach, town and La Cigale restaurant. A visit to the stunning Sao Rafael Beach is a must, west of Albufeira marina. Arrifes Praia,our favourite hideaway little, Blue Flag beach, besides S.Rafael. Top Quality, Very Private, Luxury Villa, Air Conditioning, Large Private Pool with sea views, pretty gardens & lawn. 5 bedrooms, 4 Bathrooms, Air Conditioning, Luxury Villa, for 10- 12 persons + infants. With Optional pool heating. This superb, Very Popular, Luxury Villa with Air Conditioning, occupies a prime location with lovely sea views from ground floor, to the magnificent 2nd floor terrace, with amazing panoramic views of the whole bay of Albufeira and beyond, as far as the eyes can see. Perfect located in the beautiful Quinta da Balaia Resort. Villa Estrelicia, is rented (exclusively) with 5 bedrooms. 1 Large twin bedroom on ground floor with private bathroom & terrace, 2 bedrooms on the first floor each with a private bathroom & share a large terrace with superb all round views, including sea views, there a 2 further bedrooms on the lower ground floor, continuation with steps down from ground floor to 4th & 5th bedrooms, both with twin beds, smaller rooms, but comfortable bedrooms with buil-in wardrobes with full mirrors, bedside cabinet, no views, with natural light double glazing window, complete with air conditioning , and both of these two bedroom sharing a full bathroom. The villa is never rented separately, it is always rented exclusively yours, with 3, or 5 bedrooms. Come night time, do go up and enjoy, stunning night time views from this magnificent 2nd floor panoramic terrace. Entrance to the Villa Estrelicia. is on the ground floor:- There is the largest room with twin beds (the Red Room), with a private covered terrace, electric shutters a private bathroom and sound system. On the ground floor there is also, a fully equipped kitchen overlooking the terrace, pool, garden, lawn with sea views, the open plan combines the kitchen with lounge and dining area with a large dining table and chairs, Cable TV with many channels to enjoy, or you can watch one of your favourite films, from our wide and varied choice of DVD’s, or listen to some of our music CD’s. Or, listen to your favourite radio station, or play music from your iPod on our individual sound system. Double doors with electric shutters from the lounge/dinner lead you to the pool terrace, pool, gardens and lawn, with lovely sea views. On the ground floor there is also a separate w.c, and basin. On the first floor there are 2 bedrooms, the Turquoise Bedroom, and the Lime bedroom, each with a full private bathroom, double doors and windows with electric shutters, and a superb sunny terrace commanding superb land and sea views. All of the bedrooms on the ground floor and first floor all have an individual sound system, so has the kitchen, the adjoining lounge/dinner, including the pool terrace. This villa is fully air conditioned throughout, including the lounge/dinner wit flat screen Cable TV, DVD & CD. As for the large 9 m x 4.5 metres pool, can be heated pool at an extra cost, and in the garden, there is a large, perfectly placed, built-in barbeque facing the pool, so you can see what is going on not just in the pool, but all around you. Villa Estrelicia is located with Quinta da Balaia, one of the most delightful spots on the Algarve with extensive lawns & lush vegetation covering an area of 35,000 m². The villa is only 1.6 kms from many, stunning, picture postcard beaches, including the beautiful Santa Eulalia sandy, and walking distance to shops & restaurants. 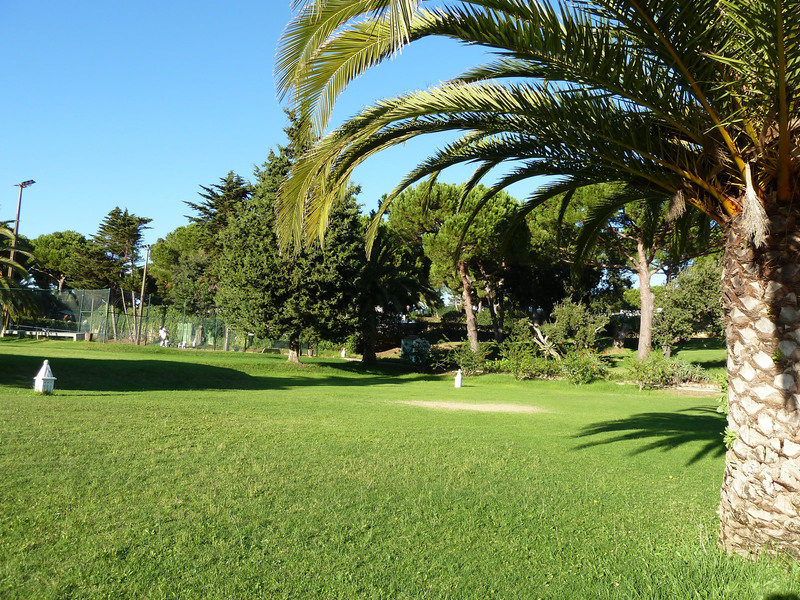 Within the Quinta da Balaia complex, there’s street lighting, security, extensive gardens with thousands of well maintained trees & plants, creating rich vegetation, offering a relaxed & comfortable atmosphere. Within Quinta da Balaia, there’s also a communal pool and a seasonal poolside restaurant serving good choice of meals, snacks & drinks throughout the day & evenings. There’s also several all-weather tennis courts (two floodlit), mini market & a lovely children’s playground. Perfect location & surroundings in Balaia/Albufeira: Quinta da Balaia Resort is a much sought after resort, located in a prime location with a good central, green Albufeira location. Enjoy great views staying at Villa Estrelicia in Quinta da Balaia’s beautiful complex resort, perfectly located, very private with beautiful surroundings. Close to absolutely everything. Villa Estrelicia, is a little piece of heaven located within the heart Albufeira. Balaia is indeed, one of the most delightful spots on the Algarve with extensive lawns & lush vegetation covering an area of 35,000 m², just 1.8 kms from many, stunning, picture postcard beaches, walking distance to shops & restaurants. Within the complex, there’s street lighting, security, extensive gardens with thousands of well maintained trees & plants, creating rich vegetation, offering a relaxed & comfortable atmosphere. Within Balaia, there’s also a communal pool with a poolside restaurant serving good choice of meals, snacks & drinks all day & evenings. Pool is free, if you consume in the restaurant or bar. Within Quinta da Balaia, there is are also several all-weather tennis courts (two floodlit), a mini market & playground. There are several, nearby golf courses. Faro airport is only, a 40 minute drive away. Picturesque, quite location with many facilities, including mini market, restaurant, tennis, children’s playground within Quinta da Balaia. Or, try a great local restaurant just 600 metres from the villa door, by the main entrance to Quinta da Balaia and reception. 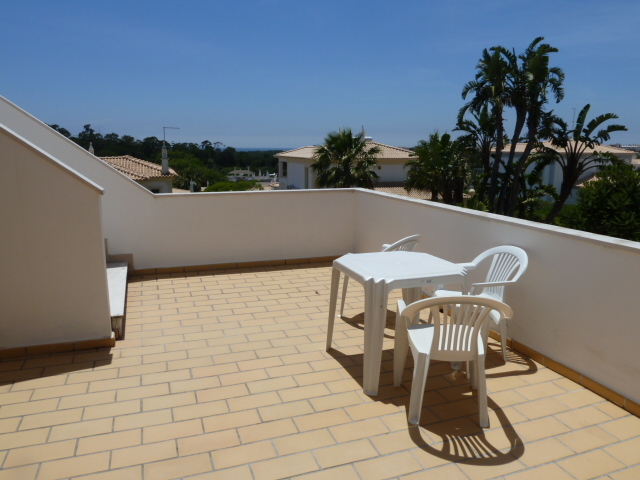 From the reception, entrance to Quinta da Balaia, and only 700 metres away, there is the Santa Eulalia road, with many shops, wide & varied choice of restaurants, a few bars, pubs, supermarkets, hairdressers, cafes, bars & night life. There are many beautiful and stunning sandy beaches nearby, including the picture postcard, and your local sandy beach of Santa Eulalia, just 1.6 kms away. As for shopping, there’s Albufeira old town, just 4 klms away, or there’s Guia/Albufeira shopping, home to the best shopping mall, on the Algarve just 10 minutes drive from the villa, with many famous names, Zara, Mango and many others, including cinemas, restaurants, Continente supermarket and more, open every day until midnight. Please note: The villa qualifies as a luxury villa is because it has air conditioning, quality furniture, panoramic views, and superb bay and sea views. Best beaches, sunny, quality resort in Europe: Picture postcard beaches can be found throughout the Algarve, non so, than around the beautiful region of Albufeira where this villa is located. 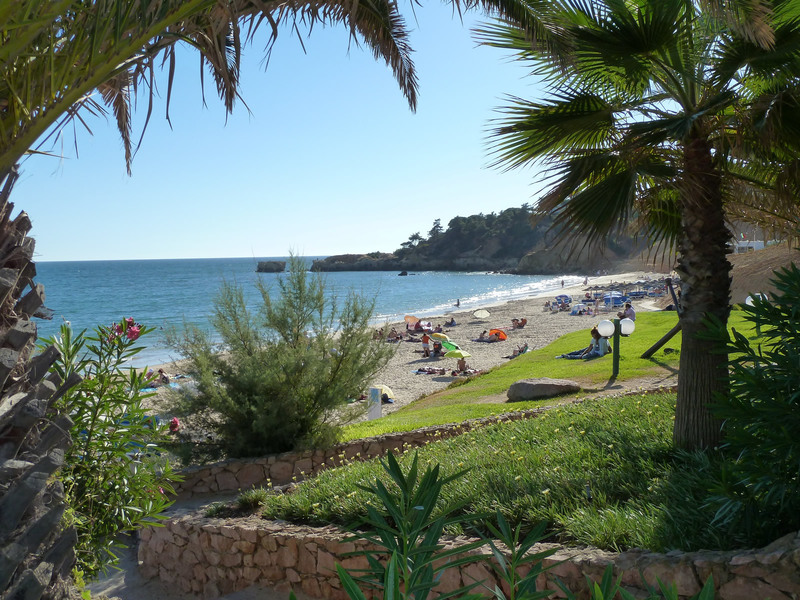 The best equipped beach near the villa, is Praia Santa Eulalia just 1.6 kms away, you’ve got to see it to believe it, an absolutely gorgeous beach, with bar, restaurant, etc. There are many beaches nearby; Olhos de Agua is a must! 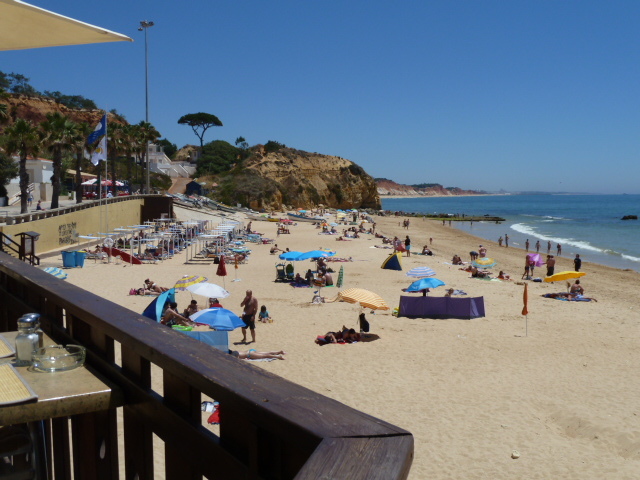 The Colourful Praia da Oura beach, Maria Luisa beach, Falesia beach, with its, long strech of golden sands ideal for sunbathing and long walks, take time also, and go to Albufeira’s, colourful and lively old town Fisherman’s beach. Not forgetting, west of the colourful Albufeira marina, there are many beautiful and stunning beaches can be found, including the beautiful Sao Rafael beach is a must, our favourite little hideaway beach of Arrifes beach.Not forgetting, Coelha beach, Praia Grande and many others, all very pretty beaches, most, blue flag beaches, all the way to Gale. Inland Algarve is well worth exploring including the local villages, mountains of Monchique, also, visit the oldest town on the Algarve, Tavira! known as The Venice of the Algarve. Also, ensure you visit the pretty, neighbouring Cabanas fishing village for lunch or dinner, at one of the many restaurants overlooking Ria Formosa nature reserve river. Balaia Golf Village, 9 Holes, Par 27, course distance 984 m/1177 yd. Located in Balaia, Albufeira, Algarve. Pine Cliffs Golf, 9 Holes, Par 33, Course distance 2227 m. Located close to villa in Falesia, Albufeira, Algarve. Salgados Golf, 18 Holes, Par 72, Couse distance 6080 m. Located near villa in Albufeira, Algarve. The nearby resorts of Vilamoura with six, 18 hole golf courses, including the Par 72, 6560 m Victoria Golf Club; Vale do Lobo and Quinta do Lago with six, 18 hole golf courses, including the acclaimed Par 72, 6238m San Lourenzo Golf Course. Other Algarvean courses – they are also easily accessible, within short distances by car, by motorway which is 5 min drive from the Villa. Seven golf courses can be found further West on the Algarve, with a further four golf courses on the Eastern Algarve, again with easy access via the motorway (charges apply). Sunny. South facing villa with sea views. 9 m x 4.5 m large heatable pool. Air conditioning. Panoramic 1st & 2nd floor terraces with amazing, land & sea views as far as the eyes can sea. Early booking is highly recommended. This superb, very popular, Luxury Villa with Air Conditioning, occupies a prime location with lovely sea views & panoramic views, as far your eyes can see. Perfect located in the beautiful Quinta da Balaia Resort. Villa Estrelicia, 5 bedrooms with 4 bathrooms, (3) en-suite. All of the accommodation is spread over 3 floors, air conditioning throughout, lounge/dinner with Cable TV, DVD & CD, lovely gardens & lawns including a very private, large 9 m x 4.5 m pool (heated pool, extra cost). The villa enjoys a very private, superb location, commanding sea views from all floors. Superb panoramic views can be enjoyed from the first floor terrace with 2 bedrooms have access to this large terrace with sea views. There is also a further terrace on the 2nd floor, which enjoys even more amazing, undisturbed land & sea views of the whole coastline, neighbouring villas, local golf course & countryside. Come night time, amazing 2nd floor terrace is a must, for amazingly beautiful night time views. Villa Estrelicia, has 5 bedroom, 4 bathrooms with 3 bathrooms – en-suite ! . 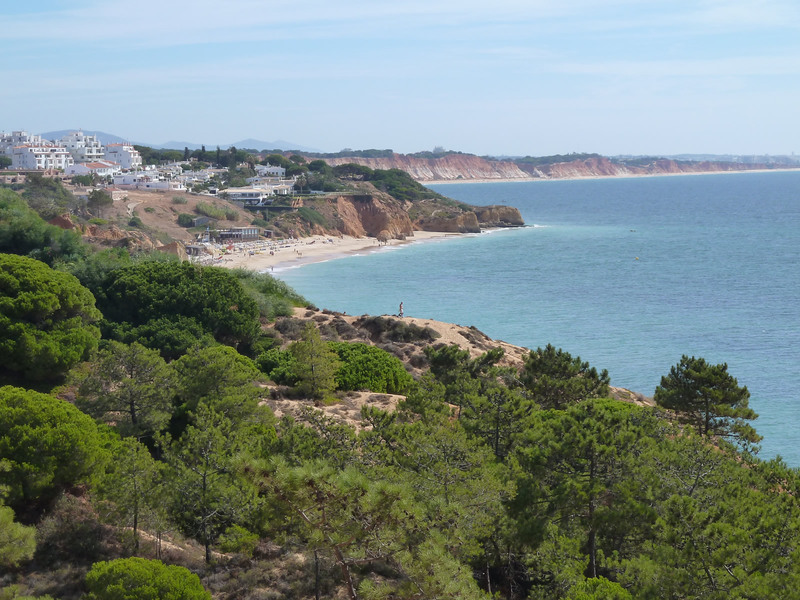 Just 1.6 kms from many, stunning, picture postcard beaches, including our favourite and nearest Santa Eulalia beach. Walking distance to shops & restaurants. Within the Quinta da Balaia complex, there’s street lighting, security, extensive gardens with thousands of well maintained trees & plants, creating rich vegetation, offering a relaxed & comfortable atmosphere. Balaia is one of the most delightful spots on the Algarve with extensive lawns & lush vegetation covering an area of 35,000 m², just 1.6 kms from many, stunning, picture postcard beaches, walking distance to shops & restaurants. Picturesque, quite location with many facilities, including mini market, restaurant, tennis, children’s playground within Quinta da Balaia. Or, try a good local restaurant just 600 metres from the villa door, by the main entrance to Quinta da Balaia and reception. From the reception, and only 700 metres away, there are many shops, including a wide & varied choice of restaurants, a few bars and pubs, supermarkets, hairdressers, cafes, bars & night life. There are many beautiful and stunning sandy beaches nearby, including the picture postcard, sandy beach of Santa Eulalia, just 1.6 kms away. As for shopping, there’s Albufeira old town, just 4 klms away, or there’s Guia/Albufeira shopping, home to the best shopping mall, on the Algarve just 10 minutes drive from the villa, with many famous names, Zara, Mango and many others, including cinemas, restaurants, Continente supermarket and more, open every day until midnight. Best beaches, sunny, quality resort in Europe: Picture postcard beaches can be found throughout the Algarve, non so, than around the beautiful region of Albufeira where this villa is located. The best equipped beach near the villa, is Praia Santa Eulalia just 1.6 kms away, you’ve got to see it to believe it, an absolutely gorgeous beach, with bar, restaurant, etc. There are many beaches nearby; Olhos de Agua is a must! Colourful Praia da Oura beach, Maria Luisa beach, Falesia beach, with its, long stretch of golden sands ideal for sunbathing and long walks, take time and go to Albufeira’s, colourful and lively, old town and Fisherman’s beach. West of Albufeira marina, many beautiful and stunning beaches can be found, including the beautiful Sao Rafael beach is a must, our favourite little hideaway beach of Arrifes beach, not forgetting, Coelha beach, Praia Grande and many others, all small pretty beaches, most, blue flag beaches, all the way to Guia. Inland Algarve is well worth exploring including the local villages, mountains of Monchique, also, visit the oldest town on the Algarve, Tavira! known as The Venice of the Algarve. Also, ensure you visit the pretty, neighbouring Cabanas fishing village for lunch or dinner, at one of the many restaurants overlooking Ria Formosa nature reserve river. Sleeps 10 in beds, plus 2-3 extra folding beds available at extra cost which includes bed linen, pillows, bathroom & pool towels are provided for adults or children + Infants cots & high chairs available. 3 BEDROOMS on ground & 1st floor have marble flooring private bathrooms & individual sound system. On the Lower ground there are 2 BEDROOMS & 1 bathroom with tile flooring. ALL 5 BEDROOMS have the same style furniture, all with air conditioning. 1st floor (Lime Green bedroom) with Sea views. 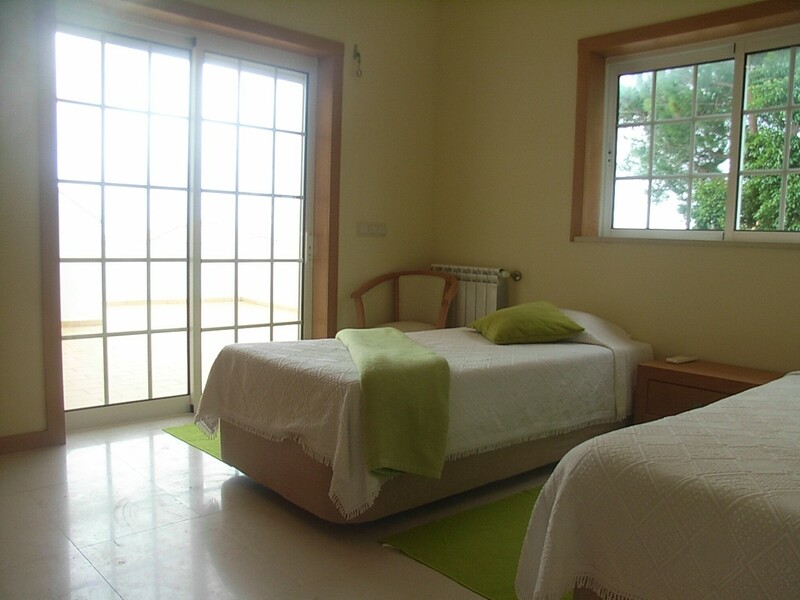 Twin beds, with electric shutters window & double doors to a large terrace. Plus access to another terrace, a panoramic terrace commanding magnificent, undisturbed, land and sea views. sharing the same, large terrace as the the Lime Green room, with stairs to the rooftop panoramic terrace. Bedroom 3: Ground floor. (Red Room) Largest room, Twin beds, double doors to private terrace & garden. Bedrooms 4TH & 5TH Bedrooms:- No views, with Double glazing large window with natural light (Turquoise & Lime twin room): both rooms, share a full bathroom! All the bathroms in the villa are modern, light and bright! with marble fooring from floo to ceiling. *Ground floor WC: consisting of basin and WC, with marble fooring from floor to ceiling. *1st floor: consisting of 1 private bathroom, with window, with bath/shower, WC, bidet and basin with marble fooring from floo to ceiling. *1st floor: consisting of 1 prbathroom en-suite with window, with bath/shower, WC, and basin with marble fooring from floo to ceiling. *Lower ground floor: consisting of 1 seperate bathroom, with bath/shower, WC and basin, with modern, stylish tyles, from floor to ceiling. *Villa Estrelicia when rented, is always exclusivelly yours with 5 bedrooms. *Large, private pool 9 x 4.5 meters with extra walk-in roman steps (heated pool extra cost) *Full Air Conditioning. *Maid service. *Internet access (optional). Marble & tile flooring throughout. *Cable TV, & DVD player. *Built-in Stereo sound system in most bedrooms, kitchen, lounge/dinner & pool terrace. *Coffee machine *Hair dryer. *Partly covered terrace. *Gardens & lawn *9 m x 4.5 metres, freshwater pool with built-in steps (1.16 m to 1.82 m deep) *Gated villa *Extra z beds available *Car hire not required. Facilities within Quinta da Balaia. *Extensive gardens. *Mini Market. *Public telephone. *Children’s playground. *Seasonal poolside restaurant and bar serving lunches, dinners & snacks. *All- weather tennis courts. * Floodlit tennis courts *Tennis coaching for all ages. *Prices include on arrival: Milk, water, wine biscuits. 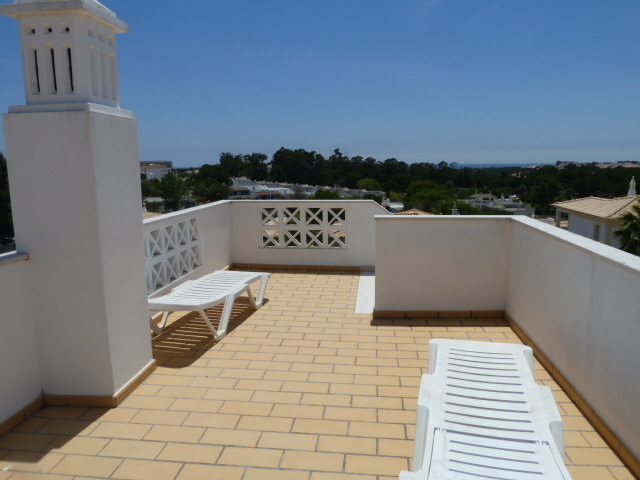 Beautifully located within Quinta da Balaia, Albufeira. * Children’s playground, tennis, mini market & restaurant, within Quinta da Balaia. We were collected from the airport by the transfer team arranged via the owner. Faultless. 30 mins drive to the villa- wow! So clean and spacious. My extended family of 8 had a blissful holiday in a beautiful part of the world. Thd villa had everything we could have needed. We cooked and are in and also ate out. 100’s of amazing restaurants 15 min walk away. The complex on which the villa is situated was a little dated and unkempt , but we only ever walked or drove through – so not a problem at all. The pool was fantastic- paying the extra to have it heated was well worth the money. Our group was 4 adults 3 teenagers and 1 baby- enough space for everyone to relax and enjoy. Vila muito boa para passar férias em família. É o segundo ano que aqui passo férias, com familiares, e vou voltar. Em local com amplas zonas verdes, sossegado e de acesso rápido às zonas movimentadas de Albufeira. Das melhores na relação qualidade preço. We hebben met ons gezin (totaal 10 personen) een heerlijke herfstvakantie doorgebracht in deze prachtige villa. Alles erop en er aan. Ook helemaal zoals op de site vermeld. Muziek binnen en buiten, ruime woning, ruime kamers, ruim terras en goed uitrusting in de keuken. Zelfs een bbq ontbrak niet. Maar een klein stukje verderop zit een goed restaurant en ook een goede pizzeria, dus vooral niet elke dag koken! Een echte aanrader dus! Voor jong en oud! My family and stayed at the Villa Estrelicia in April 2016 and had a great time. We found the villa to be modern, clean and well equipped and everything was as had been detailed in the description. Our party consisted of 4 adults and 6 children and the villa was both spacious and comfortable for us. For example there was plenty of seating and dining options for us both indoors and out. 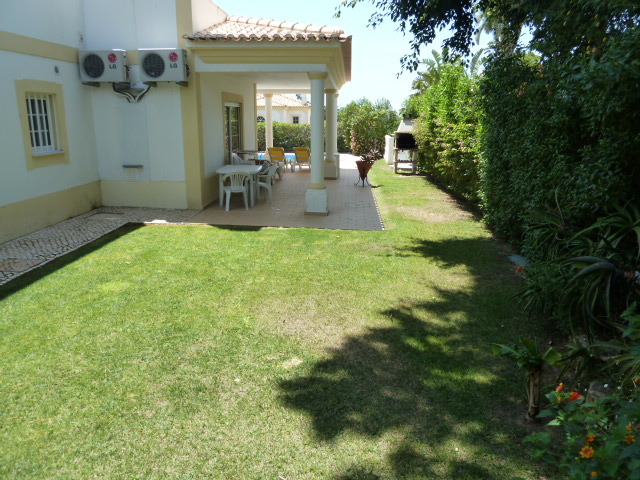 The location of the Villa was further away from Albufeira Strip than we have stayed in the past, however this was not an issue for us as there were details of a reasonable and reliable transfer company that served the villa. There was also a well stocked mini market within the complex. We received fantastic customer service from Carlos, from the first to the last enquiry, and any queries that we had were promptly answered and dealt with. I would highly recommend this Villa to any fellow travellers as you will not be disappointed. We added pool heating to our reservation, and it was well worth while. The children were able to swim in the pool all week, even in April. This was our second time to the villa and it was fantastic.there were nine of us in the group and the villa was spacious and comfortable for us all. We chose to have the pool heated as we visited in April and it was just the right temperature. I would recommend choosing this if you’re going out of season. The BBQ area was brilliant.we stayed in a couple of nights and enjoyed BBQS and lots of wine outside on the patio area. I can’t sing the praises of this villa enough- it’s private so you don’t feel overlooked by anyone,it’s a very high standard of furnishing,the pool and BBQ area were both excellent. We also made full use of the ‘one euro per person’ taxi travel.we could text or what’s app the taxi company meaning we didn’t run up a big phone bill. If you’re looking for a spacious,comfortable villa then choose this one; a lovely property and the team behind it were brilliant help with all the organising. Lovely villa in good location and well equipped. Villa Estrelicia, Albufeira, Algarve. The property was very well equipped and had everything we needed to have a very enjoyable holiday. The pool and garden was lovely and well sheilded from the road. The property is a good walk from town but definitely do-able and taxi’s were very easy to get hold of and cheap to use – only 5-10 euro’s for 8 people. The restaurant on site was not open when we visited (May) but the Italian restaurant on the main road near the main entrance to the site was very good with excellent food and friendly staff. After a night out we often also enjoyed the good range of DVD’s that were in the villa. The kitchen had everything we needed -a good sized fridge, dishwasher etc and the welcome pack of wine, tea etc was a very nice touch. We found the recommended taxi numbers provided by the villa very friendly and helpful – willing to make recommendations and to pick us all up (including our considerable shopping at times) at all times of day. We would definitely use this villa again. Perfectas vacaciones en Vila Estrelicia. La casa dispone de todas las comodidades y se encuentra situada en un lugar tranquilo y a la vez a pocos metros de la zona mas animada de Albufeira. La piscina climatizada es impresionante. Esperamos volver el próximo año.